Yamashita Yūjirō Shōten, name and address. Yamashita Shōten or Yamashita Yūjirō Shōten, later Chūō Shashin-yōhin, was a Japanese distributor. The company Yamashita Shōten was already active in 1921. Its address at the time was Kōjimachi-ku Dōri 2–7 in Tokyo (東京市麴町通二丁目七番地). It was sometimes called Yamashita Yūjirō Shōten, where Yamashita Yūjirō is a personal name, perhaps that of the founder. The short and long name were used indifferently from the 1920s to the early 1940s. The address from 1935 to 1942 was Kōjimachi-ku Kōjimachi 1–6 (東京市麴町区麴町一丁目六). Yamashita acted as authorized dealers for a variety of cameras. It was the sole distributor of products made by Shinkō, among which the Shinkoflex, the first Japanese 6×6 SLR. The company certainly owned the brand name "Rondo", under which it sold a variety of photographic products. The Rondo logo is a man's silhouette, it appeared on advertisements dated 1939 to 1942. It also sold a variant of the Tsubasa Super Semi under the name Rondex. Yamashita certainly also owned the brand name "Sun", and it sold the Sun Stereo camera and offered an auto stop advance retrofit for 4.5×6 folders, called "Sun film stop". After the war, the company emerged in April 1946 as Chiyoda Shōkai, based in Ginza and established by Yamashita Yūjirō and Hashimoto Tadamasa (橋本忠政), as was clearly stated in an advertisement in Ars Camera. The company Chiyoda Shōkai would operate well into the 1950s, but Yamashita Yūjirō probably left at some time to found another company, again called K.K. Yamashita Yūjirō Shōten (㈱山下友治郎商店), based in Ogawamachi and known to be active in February 1950. In March or April 1950, the name of the company was changed to Chūō Shashin-yōhin K.K. (中央写真用品㈱), translated in English as Central Photo Supply Co., Ltd., at the same address. The company used the brand name Rondo again from 1951 to 1959. The most recent mention of the company found so far is dated February 1959. In the mid-1920s, Yamashita imported the Thowe plate folder and the KW Patent Etui. In 1939, Yamashita Yūjirō Shōten advertised an auto-stop device called Sun film stop (サンフィルムストップ), offered as an aftermarket conversion for various 4.5×6 folding cameras. The conversion consists a metal casing replacing the regular advance key, supporting an advance knob, a large exposure counter disc and a sliding lever at the front to unlock the advance after each exposure. The device looks like the auto-stop mechanism of the Plaubel Roll-Op but is not a plain copy. It was made by an unknown company. 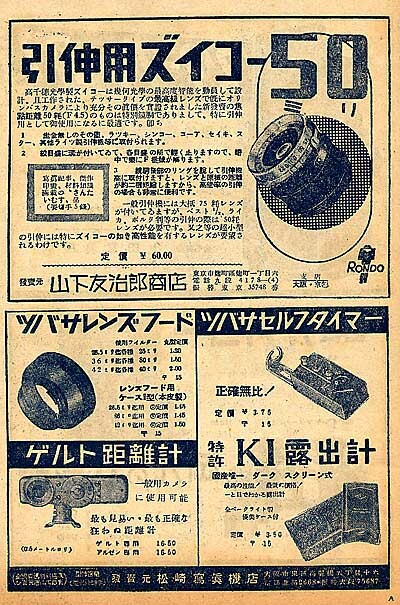 The January 1939 advertisement in Asahi Camera shows the Sun film stop mounted on a Semi Prince with Pronto shutter, gives the price of ¥5 and says that the conversion was available for the 4.5×6 Super Ikonta, Ikonta, Nettar, Welta Perle, Semi Lyra, Semi Minolta and Semi Prince. These products were distributed by Yamashita then by Chūō. The Wacoh A, made by National Kōgaku is attributed to Chūō in some sources, perhaps because it was distributed by the company. This page of the AJCC website attributes the Semi Dak to Chūō but other sources attribute it to Asahi Shōten (朝日商店). ↑ The earliest advertisement observed so far with "Yamashita Yūjirō Shōten" is in Ars Camera November 1924. The advertisement in Shashin Salon January 1934, and other advertisements dated March 1936 and February 1942 reproduced in Kokusan kamera no rekishi, pp.71 and 74, have the short form "Yamashita Shōten". The Shinkoflex page of the JCII collection says Yamashita Shōkai (山下商会) by mistake. ↑ Advertisements reproduced in Kokusan kamera no rekishi, pp.62, 71, 74, 89–90, 92–3 and 106. The address is the same for "Yamashita Shōten" and "Yamashita Yūjirō Shōten", confirming that this is the same company. ↑ Advertisements reproduced in Kokusan kamera no rekishi, pp.89, 93 and 106, and advertisement reproduced in Nostalgic Camera by Toshio Inamura. ↑ Rondex distributed by Yamashita: Kokusan kamera no rekishi, p.344. ↑ Advertisement in Ars Camera April 1946, p.30. The exact address was Tōkyō-to Kyōbashi-ku Ginza 7–3 (東京都京橋区銀座七丁目三番地). ↑ Advertisement dated February 1950 reproduced in Kokusan kamera no rekishi, p.180. The address was Tōkyō-to Chiyoda-ku Kanda Ogawamachi 3–8 (東京都千代田区神田小川町3–8). ↑ An advertisement dated April 1950, reproduced in Kokusan kamera no rekishi, p.180, says that Chūō Shashin-yōhin is the new name of Yamashita Yūjirō Shōten (山下友治郎商店改称). The English translation appears in an advertisement reproduced in Kokusan kamera no rekishi, p.117. The address in Ogawamachi is the same as that of K.K. Yamashita Yūjirō Shōten, as appears in the advertisements dated 1950 to 1959 reproduced in Kokusan kamera no rekishi, pp.117, 138, 150, 180–1 and 281. ↑ Advertisements reproduced in Kokusan kamera no rekishi, pp.117, 138, 150, 181 and 281. ↑ February 1959 advertisement reproduced in Kokusan kamera no rekishi, p.281. ↑ Advertisements reproduced in Kokusan kamera no rekishi, p.71. ↑ Extract of the catalogue of Yamashita Yūjirō Shōten dated April 20, 1937, reproduced in Kokusan kamera no rekishi, p.84. ↑ Extract of the catalogue of Yamashita Yūjirō Shōten dated April 20, 1937, reproduced in Kokusan kamera no rekishi, p.91. ↑ Advertisements reproduced in Kokusan kamera no rekishi, p.62. ↑ Advertisements reproduced in Kokusan kamera no rekishi, pp.78–9. ↑ Advertisements reproduced in Kokusan kamera no rekishi, pp.71 and 89–90. ↑ Advertisement reproduced in Kokusan kamera no rekishi, p.90. ↑ Advertisements reproduced in Kokusan kamera no rekishi, pp.89 and 106. ↑ Advertisement reproduced in Awano, p.10 of Camera Collectors' News no.332. ↑ Advertisements reproduced in Kokusan kamera no rekishi, pp.89, 92–3 and 106, and in Awano, p.10 of Camera Collectors' News no.332. ↑ Advertisement reproduced in Kokusan kamera no rekishi, p.92. ↑ Column in Asahi Camera January 1939, p.190. ↑ Sugiyama, item 3829, repeated in McKeown, p.206. ↑ Asahi Shōten: Sugiyama, item 4175; Kokusan kamera no rekishi, p.354. Ars Camera. Advertisements by Yamashita Shōten in September 1921 and February 1922, by Yamashita Yūjirō Shōten in November 1924. No page numbers. Ars Camera. Advertisement by Chiyoda Shōkai in April 1946 (p.30). Shashin Salon. Advertisement by Yamashita Shōten in January 1934. No page number. This page was last edited on 22 May 2017, at 05:33.